As previously noted, below you'll find Part Two of your narrator's Q&A for Michael Sean Winters at the NCR's Distinctly Catholic. As this isn't the kind of thing you'll find in The New York Times -- or, for that matter, pretty much anywhere else -- thanks again to everyone who's lent a hand to keep these pages coming your way. Compared to keeping the bills paid and the lights on, an analysis of this sort is a breeze, so to everyone who's made the former burden manageable and, ergo, the latter grace possible, just remember that this one's for you... and, indeed, thanks to you. All that said, today's DC Question is "Who is an up-and-coming bishop we should keep an eye on and why?" Being accustomed to its sprawling nature, many of us tend to give it short shrift, but globally speaking, the US church is an immense enterprise -- only Italy and Brazil have more bishops, and given the scope of the turf here, it’s impossible to boil the situation down into a single column because, well, the culture of Catholicism in New England and New Mexico are two drastically different things. As much as ever, the story of this moment in the American Catholic journey is that of divergent realities of East and West... only now, the latter finds itself in the driver’s seat of the national fold’s future -- and in a scenario that defies all precedent, with the South riding shotgun. For those of us who appreciate things through the lens of history, this is nothing short of an epochal shift, and God knows it makes for fascinating watching. All that said, back to the main point: on a bench that counts some 300 active bishops and exists in a constant state of churn, I can’t really narrow my mind down to one rising star. And maybe that’s a fitting reflection on the conference’s dynamic at this point in the game. See, the days of one “strongman” bishop as the church’s de facto National Leader -- a line extending back to John Carroll, then John Hughes and James Gibbons, to Francis Spellman and his successors -- ended on 3 May 2000: that is, the night John Cardinal O’Connor passed from our midst. The scribe could go on, but you get the idea. In a changing conference leading a changed church -- and one fallen on harder times than any of us have ever known -- the need for effective, credible, savvy leadership only becomes all the more pressing. And while this observer still hasn’t a clue what way the body will swing come mid-November in Baltimore as it elects its next vice-president -- a race that, thanks to all the new, markedly centrist blood in the electorate, feels more up in the air than it’s been in quite some time -- here are a couple names readers might well find guiding the high-hat fold as it journeys on over the years and decades ahead. And, lastly, lest anyone start trying to connect dots that don't exist, keep in mind that these names are listed in alphabetical order. With that, away we go. 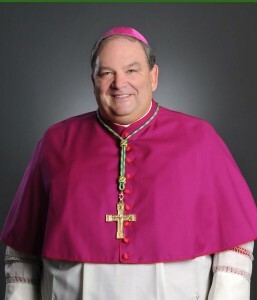 Paul Etienne, 51, bishop of Cheyenne: As the current state of things has made the high-hat an ever heavier object, “within reach of power tools” is probably the last place you’d want a nominee to be on learning of his appointment. 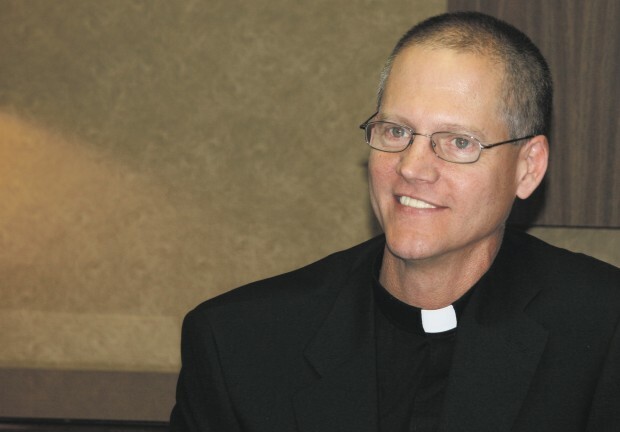 But, indeed, it was while brandishing a chainsaw to chop some trees on a Monday off last summer that Etienne got the call informing him that he was B16's choice to head Wyoming’s statewide diocese, which had been vacant for nearly 18 months. Luckily, the rural Indiana pastor didn’t harm himself at hearing the news, accepted, and in retrospect, the moment vindicated the wisdom of the selection process: if you’re seeking a good fit for Wyoming, someone whose idea of relaxing is cutting trees (and who, with his priest-brothers, swapped hunting rifles as ordination gifts) would be hard to beat. Keeping with the “golden thread” highlighted yesterday, Etienne was pastoring two country churches when the nuncio’s call came; one was his boyhood parish, his parents still living in its lines. On a farewell tour of his prior assignments before heading West, each Mass was packed and said to be notably emotional. Yet behind the woodsy angle lies a veteran of the national scene, with a pedigree that some Catholic conversationalists might find rather curious. More to the point, the young bishop of Yellowstone Country brings a refreshing shot of openness to the table; performing his first priestly ordination, he preached about his own struggles with accepting celibacy, he blogs daily, and a recently-released vision statement for the diocese saw Etienne speak of his longtime “ache” over the high number of inactive Catholics and call for a new spirit of outreach. As a progressive friend in Wyoming recently put it, the bishop has "worked wonders" in his first year on the job... pointedly adding that, with the new boss’ arrival, “the Council has finally arrived” in the Cheyenne church. Daniel Flores, 49, bishop of Brownsville: Usually, the head of one of the nation’s 15 dioceses with a million or more Catholics wouldn’t be eyed as a cleric yet to make his mark, but as someone already established in the top tier. When it comes to the guy known at home as “Bishop Danny,” however, one can’t help but see even bigger things ahead. 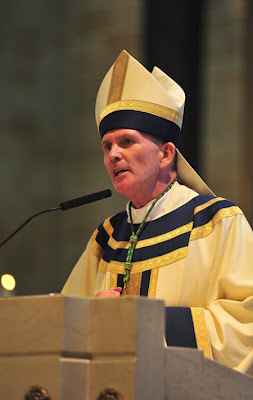 As noted yesterday, before the South Texas-born prelate’s December return from Detroit after braving (by his count) “three winters” as an auxiliary there, no Hispanic bishop of any age had ever been given a Stateside diocese of a million-plus, and no Anglo still in his 40s had nabbed a post so massive since Roger Mahony’s triumphant homecoming to LA a quarter-century ago this month. That alone should underscore the height of expectations Rome has for the 49 year-old who’s quickly carved out a rep as one of the most intense, brilliant, charismatic figures in the Stateside church’s emerging generation of leadership, even if his national profile is still to launch. Able to quote verbatim from Thomas in Latin, Tolkien in English and Sinatra in song, with a mind for penning poetry in his spare time, Flores inherited a border church that’s home to the most densely-Catholic population per capita (85%) of any US diocese. Its boom shows no signs of abating, either; tripled in size since 1980 and doubled since 1990, a majority of today’s Brownsville church is younger than age 25. Impressive as that sounds, it gets even better -- another 2,000-plus celebrated outside. On an ecclesial scene whose ever-warring echo chambers barely seem to agree on Revelation, that breadth of regard says it all. Over the course of his reign, B16’s shown a distinct liking for the Steel City, naming three more of its native sons to head dioceses (for a grand total of seven), sending the native-born former ordinary to the nation’s capital, bringing the energetic, pastorally savvy Bishop David Zubik home in Donald Wuerl’s footsteps... and above all, in Dan DiNardo, giving the Burgh its second native-son to reach the brass ring and don the cardinal’s red hat. In the end, Hebda had to settle for half his wish -- as opposed to a return to the Burgh, his ticket out of the Vatican saw him dispatched to the northern reaches of Michigan, where the nuances of the canons are about as useful as shorts in December. But the move was no exile -- despite his path, like most of his fellow appointees under Benedict, Hebda’s blood runs more pastoral than administrative; fresh from the Greg, he spent three years on a pastoral team tasked with serving a new parish formed from the closure of seven churches, then led a local college’s Catholic center when the call to Curial service came. Seen far more widely as “brilliant, generous, gentle and pious” than through the lens of ambition -- the latter being, as never before, a particular file-killer in Benedict’s value-judgment -- even if he was heading to a place he’d never been before, simply returning to the trenches made for an especially happy homecoming. David O’Connell CM, 55, coadjutor-bishop of Trenton: As the dust kicked up by the church’s battle royal over health-care reform was still settling, at the episcopal ordination of a figure (strangely) viewed as "arch-conservative" by his critics, one face particularly stuck out in a front pew of Trenton cathedral: the bishops’ bete noire of the health-care brawl, the president of the Catholic Health Association Sr Carol Keehan. The move was vintage Dave O’Connell. Policy spat, hell or high water, nothing would get in the way of having a close friend of three decades sit with his family -- and, later, be offered a dinner seat alongside the Vatican crowd in attendance -- as, after years of widespread chatter over where the 14th president of the Catholic University of America would end up, the Philly-born Vincentian landed in an unsung gem of the downtrodden ecclesial Northeast: Central Jersey’s 850,000-member diocese, home to a notably happy presbyterate, the nation’s second-largest crop of permanent deacons, nationally-recognized lay ministry efforts and, all around, a warm, happy, energized local church. Sure, he might be anything but a stranger to the Floor at the “Fall Classic” -- even if he’d rather be singing karaoke down in the lounge. Still, not in memory has the body nominated a member for a committee chairmanship who has yet to attend his first Plenary as a bishop. Then again, remember well that the last time an American priest began his episcopacy with this kind of mega-watt prominence, his name was Tim Dolan. Unlike the new Trentonian, though, even now, not even the made-for-TV Manhattanite can claim the words “CNN analyst” for himself. When that's the cred one brings to the bench, there's nowhere to go but up. But what's even more, now freed from answering to a Board of Trustees that features more bishops than the whole episcopates of multiple small countries combined, in a way, the once wild-haired religion teacher gets to be his own man again... and as that gear-shift gets underway, you might just want to buckle up. As a final note, we'd be remiss to forget two other recently-elevated, pastorally-gifted American prelates who’ll likely be key leaders on the road ahead... for now, though, they’re not members of the Stateside bench -- at least, not yet. Of course, this refers to the two US-born archbishops now serving atop Roman Congregations: the elegant, Yale-trained theologian (and B16 favorite) Gus DiNoia OP at Divine Worship, and the “Congregation for Religious’” just-named “ray of hope,” the former Redemptorist superior-general Joe Tobin, who’ll be ordained next month in St Peter’s Basilica by no less than Benedict's very "Vice-Pope." Most of the time, Vatican practice holds that the #2 officials overseeing the church's lead "cabinet" departments tend not to remain Curial lifers. Many, if not most, are eventually given high posts at home, so smart money would expect at least one to return to a major archdiocese here at some point down the line. In that light, while a lot can change in three years, one prediction’s already hit the ground, and however premature, it makes particular sense: given the latter’s Midwestern roots, penchant for collaboration, experience both in Rome and with running a large, complex ecclesial apparatus on top of his ministry-long care for a Hispanic flock whose language he's said to speak "beyond fluently," once Tobin’s done bringing the controversial and turbulent Apostolic Visitation of the nation’s women religious in for a smooth landing on all sides, the early line has already posited the Detroit-born Big Red in the mix as a strong contender for Chicago in succession to Cardinal Francis George, who reaches the retirement age of 75 in early 2012. Lest anyone forgot, the Windy City crowd can easily recall another shepherd who arrived as “Joseph, your brother”... and an encore might just work the same kind of magic. 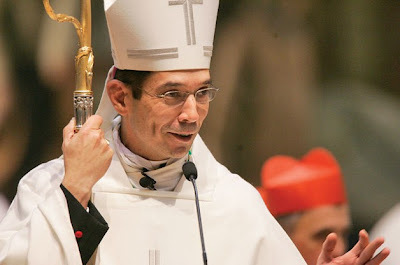 SVILUPPO: Correcting the initial draft of this piece, DiNardo was not, as previously stated, the first Pittsburgh native elevated to the College of Cardinals, but the second after Adam Maida, who received the red hat in 1994, four years after his appointment as archbishop of Detroit. The post has been edited to remedy the error. In PopeTrip's Wake, "A New Foundation"
For the Forces, B16 Taps a "Hound"
2012: B16 Into Irish Storm?